When we browse the internet, we very often come across some interactive and creative Adobe Flash files or Adobe Flash files. The animation files have caught our eyes and you are very keen to download it for safekeeping. How to download flash files such as flash videos, flash movies or flash games? Well, one of the easiest ways to download flash files is via FlashGet program. 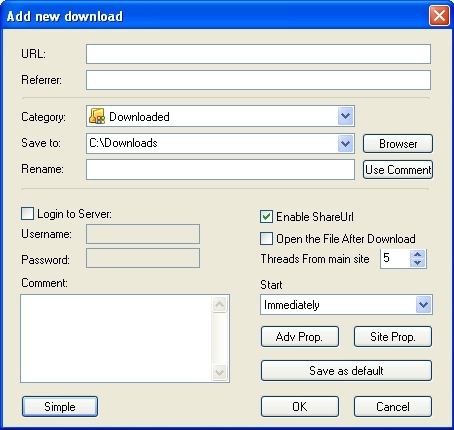 FlashGet is a commonly used download manager on the internet to download flash files. To use FlashGet to download flash files, of course the first thing you need to do is to download and install FlashGet. (Download Link via here). The latest FlashGet version, FlashGet V 1.9.6, was just released last month. This version has added a few new features such as “Add FlashGet Recommendations”, “Optimized the BT module”, “Fixed the messy code in ‘New Download’ window”, etc. Once the software has been completely downloaded and installed, you can start using this fantastic software. When you run the program, FlashGet will present you to the interface as shown in the screenshot below. From the FlashGet window, go to “File” and select “New Download”. Alternately, you can also use the shortcut key, F4, to start a new downloading task. In the latest version 1.9.6, while you are running FlashGet, you can see a small pop up message indicating the word “Download” when your mouse move over the Flash file that you want to download. If you click on “Download”, it will perform the same task like you select “New Download” from the menu bar. When you have selected “New Download”, a small pop up window will appear. You need to enter the URL of the file that you want to download. You also can do some setting from the pop-up window, e.g. add in the referrer, set category, set the source to save the files, etc. You are also required to furnish your username and password if you login to some servers. After you have clicked the “OK” button from the pop-up Window, the download process will begin. While downloading the file, you can also view the information of the file such as file size, time, speed, downloading process, etc. Of course you can also pause the downloading process and continue it later. This software caters for these user-friendly functions. Finally, the downloaded file will be saved in the destination selected by you earlier and you can use, import, export the download flash file from time to time as you like.